This month I wanted to focus on mental health and the triggers I’ve experienced with bipolar. During my junior year of high school, I remember sitting in the hallway outside the library after school with my friends listening to my Boyz II Men CD. All of a sudden sadness fell upon me, then I felt a cold tear streaming down my face. I could not remember whether it was the song I was listening to or whether it was because I was missing my sister in Australia that made me feel sad. One of my friends asked my other friend to come and ask me what was wrong. That’s when I realized something might be wrong. I wiped my tears, went home and didn’t think twice about telling my mom. Looking back now I never really realized that my emotions were up and down because they were masked with the idea that I was just being bullied in Australia and New Zealand for being dark skinned. So naturally I brushed it off as just dealing with racism and loneliness. But little did I know this was one of the culprits or triggers to what was to become bipolar later on. Mania in bipolar is rapid mood changes. 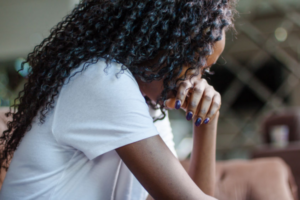 Triggers can be outside factors such as stressors or internal factors such as trauma. 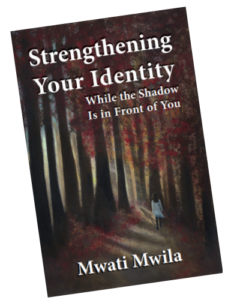 As I explained in my book “Strengthening Your Identity While the Shadow is in Front of You,” I had a childhood traumatic experience that I carried with me all those years, not telling anyone till my late twenties. Then I experienced racism first hand in Australia and New Zealand in my preteen years. In my junior and senior years of high school I experienced extreme loneliness and isolation. All this was brewing up to a recipe for disaster. All these were environmental and internal triggers that allowed the bipolar to manifest. I later trained my self to recognize early triggers that helped me deal with depression and bipolar. in my book, one of my doctors, Dr. Bradford Weeks, tells me that I am a Ferrari…I am a delicate vehicle with expensive parts to fix. I can’t be a Jeep like my friends, staying up all night, eating junk food, drinking, and with no exercise. I needed to take care of my parts because Ferraris weren’t built to go over tough terrains like Jeeps were. After college, I lived in Atlanta for three years. Looking back now, I was doing things that were detrimental to my mental and physical health. That’s was the turning point was for me. I had an epiphany – I didn’t want to live my life depressed and in hospitals. I was young and I still had a lot to give to the world. Now that epiphany wasn’t the magical one when all bad things went away. I still relapsed and went to the hospital. But it was stuck in my mind that maybe I needed to hear what other people were saying about my health. I used Dr. Weeks’ Ferrari analogy to explain to other people that we are all not Farraris. Dr. Weeks said “some of us need more fine tuning than others.” My mother also said, if I wanted to be managing these medications, and keep the harsh side effects to a minimum, I needed to really cleanse my body to have a clear mind. I wrote short poem to reflect the medications I was taking and my consistency to keep going forward in spite of the side effects. Who knew they make these kinds of meds that make your legs restless move like happy feet. But that’s when I know my angels meet to tell me something sweet as if roses are being thrown down at my feet. Knowing that I’m immune to this selfless defeat. And I know most good foods to eat. All this is a testament to a bright future I could put on repeat. If it means crowning me as the strongest woman with an undefiable stride of realm. It’s very important to know your triggers, know your plan, and know your care. I learned later on for me in addition to stress and traumas were health issues. Sugar was a big one for me. I know that the minute I ingested refined sugar, extreme euphoria and extreme depression will settle in. I know it was and still is hard for me to keep this ingredient out of my diet. Exercise is another one for me, the illness responds to exercise. I feel much better and my “feel good” chemicals or endorphins filter in and I get that natural high without the dangers of sugar or harsh chemicals. Next, you need to know or create a plan as soon as you know your triggers. One thing I admit, I neglect to do but is so important, is to create a journal. I heard this could help you not only identify your triggers but keep track of your diet and emotions. Lastly, know the plan and steps to take if you have mania. For me, I know I need to tell someone or a caregiver that something is changing. But I know sometimes this can be very difficult to recognize that something is wrong. I have my family and close friends monitoring me and will let me know, or my caregivers (my parents) are aware when there is anything odd about my behavior. I learned that you must create a plan: (Know your triggers, know your plan, know your care). This is very important to prevent a catastrophe. So in conclusion, if you find yourself with a bottle of emotions that can be emptied into the subconscious, my story may help. Also there are people who care about you who can also help you to recognize triggers. You just have to decide for yourself when to act. Mwati is a writer and a poet. 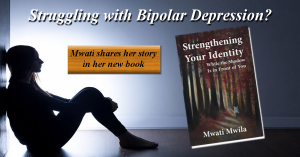 Writing is her expressive outlet and medium between spreading the word out of bipolar, which is what she suffers from and therapy with my poetic writings. 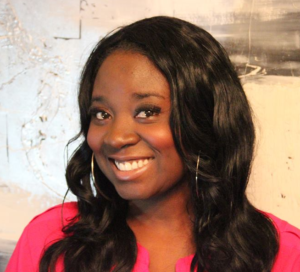 She has been living with bipolar for 13 years now, and is now sharing her story.